*~My Daisy Story~* | A Rare Flower*s Pad! ~A little note before the stories. This is a place for me to write some parts of my life I would like to share so that maybe, in reading something here, one person may be touched and realize that he, or she "may not feel alone on this earth. I would like to share some of my dreams, especially the ones that were "revelations" to me. I will add as much as I remember about the dreams which sometimes, the entry may be longer. Why dreams? I came to realize that my dreams are related to my daily living but in much severe details. I have had some dreams that are so revealing about my personal life that, through them I was able to understand the very reason why I am not loved by a "prominent" relative. I truly believe that my dreams are healing "powers" for me. I will write a few I feel are very good to share because they were about things that were not "your every day happenings" but, were very painful moments in my life that turned out to be what I like to call, "those were fixed by the MAN in the movies". In French this saying as a more meaningful punch to it "c'est arranger avec le Gas des vues ca"! The MAN being GOD (PAPA DIEU - ABBA DADDY) for HE healed those terrifying moments using the dreams. I will also write about other spiritual happenings that I think were truly revealing of HIS LOVE for me. This story occurred several years ago and its effects are still happening to this very day! I'm so blessed to have people in my life that came straight from the Hand of PAPA DIEU. One of them is you. You have no idea about the awesome E-mail Greeting you sent, meant to me. That greeting for me meant that I am in "still" in "connection" with PAPA DIEU. HE did not forget me that HE chose you to send it to me, as a reassurance that "HE is still with me." I feel now is the time for me to tell you about my DAISY story that is in my life and that you added to it also with your E-mail Greeting. Here is when and how it started. In the winter of early 1996, I went to a week of "RETREAT IN SILENCE" that was given at Le Cénacle in Rivière-du-Loup. The retreat was starting at 7 PM on Sunday evening and was ending on Saturday afternoon. The Sunday of my arrival it was only 4 PM and I had already started to cry because the summer before I had registered for that retreat when it was to be given and I had asked then if I could have a single bed room, alone. I was told yes since I was one of the first to register. Then that Sunday's retreat I had to go in earlier because your dad was working nights, it was in the winter and he didn't want me to drive that far alone, to which I was thankful to God because I had prayed that your dad would drive me there. When I arrived and checked in I was given a room number and had gone up to that room to unpack. Entering the doorway I saw 2 beds in the room. I left my bags at the door and went downstairs to tell the Clerk (woman) that there must have been a mistake about the room she had given me, that when I had registered the summer before, that clerk had put my name for a single bed room. Guess what the response was? "Madam, we have more than 60 individuals coming this week and that room you were given cannot be changed now. I'm not allowed to do that." So I persisted for her to look at the last years registration and she refused but went on telling me that what I was told then did not count. She continued saying "today is different because of the amount of people that registered". Again I persisted and said, "yes but the other 59 that are coming I'm sure did not register last summer like I had, and told they would definitively have a room like I was told I would have, for that is the only reason I had registered the summer before simply for having the choice of a room, like I had been told then. This is truly unfair." By then tears were coming out. I then decided I would leave and told her so. She replied "Leave or stay that doesn't change nothing, the room you have is the room you are to be in if you decide to stay." I then realized I could not leave because your dad was already gone, so I went back up and let the tears come out, crying mostly because I needed to be alone so much during that week so I could have a "good" retreat IN SILENCE which I had looked forward to for so long and I cried my heart out. The first session was starting at 7 PM and I wanted to be free of tears by then, and freshened up. ;I started to unpack crying all the time, when finished I sat on my bed and I was praying to PAPA DIEU, I needed HIS help so bad. While I'm praying this, I heard voices coming from the hallway, and who appears in the doorway, three elderly ladies who were looking for the room number on the door. I remember thinking and talking to God saying, "Oh please no Lord, please not an elderly lady, please." I remember feeling so ashamed for praying that way. One lady was much older than the other two. The youngest one came in the room and saw that I was all unpacked, looking around the room she "tells" me; "we have our friend here with us because she really wanted to come, but, her health is frail and she needs to get up often during the night sometimes to go vomit, and she sometimes falls when she gets up from her bed. Can we count on you to keep an eye on her, besides; our room is right facing this one across the hallway. She is in her late 80's and she needs allot of attention. Can we count on you? You only have to yell out one of our names and we'll rush in here if she falls, or vomits on the floor, or if you don't feel comfortable to bring her to the bathroom." She said all that in one breath, as to hurry to say what she needed to say before I give her my answer. When she was done she just stood there and waited for an answer. I didn't know what to say, I was in shock. I could not believe what I had just heard and what I was asked to do! I started to open my mouth to speak, but I was stuttering with "wh wh wh well yes, I guess so. Do you think I really can take care of her? She looks so frail and I don't want to hurt her." Then the third lady spoke, and said to the one that had done all the talking and said; "Listen, we were designated to be together (pointing to the oldest lady) and I think it's not fair to ask this nice lady to care for our sick friend. You are supposed to be in this room with this lady and I'll take (naming the oldest lady) where we were told to go, just in case they need to call her and come in our room and she's not there, you know? Besides she won't be able to sleep with a stranger you know her! And I think we put this lady on the spot and she has no choice but to say yes to the demands that was asked of her." Daughter, have you ever THANKED GOD WITH SWEAT ON YOUR BROW? I was dumbfounded and couldn't believe what had just occurred and the speed that was taken to leave an old woman at the mercy of a complete stranger. In my mind I started to PACK MY BAGS AND LEAVE, the plan had been set. But, the second lady won, but the youngest one was not too happy about it, but she didn't insult me or be mean to me. So she started to unpack her things, I left her and went to the ORATORY to go pray in SILENCE, and re-living what had gone on since the start of that day, what a mess it had been and even questioned if it was right for me to be in a retreat. What had hurt me the most is that, I knew, somehow, what would happen to me, was that the retreat IN SILENCE with a roommate would NOT be OBSERVED, and it was NOT at all by her. I cried from Sunday afternoon until Wednesday afternoon almost non stop, not only because my roommate was conversing constantly, but also because of the room I was not assigned to, and the retreat's goings on that were touching me like a dart going right to the bull's eye, that went on until I went to a Reconciliation service that was on Wed. afternoon, and, "dished it all out to PAPA DIEU. My "roommate's" name was Gisèle I had found that out Sunday afternoon. As you may know, my middle name is Gisèle, so, I thought, OK PAPA DIEU, YOU have something to tell me here and I don't understand what it is but, I'm stuck here until Saturday after lunch and YOU wanted me to be in this room, SPEAK, for Your servant is listening. Did I ever "listened". Gisèle never stopped talking, and we were told at every session, to respect the privacy of our roommate, and, to respect the rules of the week's, COMPLETE SILENCE even in the bathrooms, most especially in the bedrooms. Gisèle asked me everything a person wants to know about another. What was most disturbing to me was that she would tell me ahead of time what was coming next in the retreat because she had come to this retreat for the third time. Gisèle advised me what to wear one day because; we were going out for a Spiritual walk. But little did she know, was I ever a Happy Camper then for being able to pray in SILENCE!!! Another thing that bothered me allot was, every time she would come in the room where I was there doing my daily prayers or reading what was given to us, she would open the door and say, "you're still praying? Don't you ever take free time for yourself? Why do you pray so much at your age, we see that in older women like (naming the oldest lady) you're too young to be cooped up in a room like this! Go take some fresh air, go walk; it will do you more good than being in this room all the time. On, and on she would go daily. She always had something to say about my praying or reading. Then Thursday morning she dressed up and said, "dress UP today, its a very special day, full of surprise all day, I can't wait for tonight." She was ruining all the surprises for me because I was waiting for when something out of the ordinary would start. I cried and was very, very upset. I had been waiting for 15 years to be able to attend a retreat in complete SILENCE and I had not lived it yet. By the way, the oldest lady? Poor her, she had vomited the first night, second night she got up too fast to rush to the bathroom fell and hurt herself enough that she was not allowed to go down the stairs. The third night she kept her friend up all night so the friend got sick. I knew allot being in my room constantly huh? Gisèle was the spokes person. I'm telling you she never respected my privacy at all. Not even when we were in bed and I was finally almost asleep, she'd come up with a subject to talk about. Like I said above, going to reconciliation helped because I needed to get that anger out of me so I could start to experience PAPA DIEU's healing(s) or whatever I was there for, that year, with that roommate to top it all. Then to my surprise Thursday late morning we were told that after lunch we would be ALONE for a certain amount of time. All alone with GOD finally! Then tears came rushing out overwhelming me, I couldn't stop them from coming out. Yes I would be ALONE and that's when my week's retreat really started. At last my needs for "silence" would be respected. We were assigned a place (area) to go to so we could be all alone, do whatever we felt like doing. We could sleep if the need aroused. Whatever we wanted to do was our free time, not to take our watches with us, " hide our alarm clocks" the nun added, we all laughed because we heard one lady said, "I'll bring my alarm clock in my pocket." The nun that presided had not heard her say that, but just as the lady was done saying that, the nun had added the watches. We told the nun why some of us were laughing and she said," Ahh, you can't hide nothing from the Spirit, can you?" She ended by saying that after a certain amount of time someone will come get us, not to listen to a bell. We were sent off. I rushed to the bedroom to get a thick sweater, and I made a b-line out of the bedroom because Gisèle's designated room was our bedroom. And I didn't want her to start to talk to me, or tell me what was going to happen next. I put my alarm clock, and watch under my pillow so Gisèle wouldn't scold me for leaving the clock so she would know the time it was. I rushed to my designated place to be alone, at long last. From here on, I will explain the reason for the "flowers in your E-mail Greeting" that touched me to the point of sharing this story with you. The room I was assigned to was in the nun's -who presided- bedroom. That touched me because she had received a miraculous bodily healing and I thought that the room would bring me, maybe, much closer to PAPA DIEU Who had healed the person in that room, and, maybe could again but that time, me. I entered that room and I started to cry because I suddenly realized that I was finally alone, it felt so good, yet I felt sad, mad, guilty, upset, and abused for what I had gone through up to that Special time alone. I still couldn't believe what had happened, and yet I had lived through it. So I told PAPA DIEU, "please help me not to focus on what had happened but on why I am here at this retreat". That's how I had to start my being finally alone attitude because I would have dwell-ed on all the mess and loose my whole retreat's free time. There was an open Bible on a dresser, and it came in mind that I could start to focus on my needs, I went to put my finger on the open Bible's page and read where my finger landed. What I read was; (it is right that you are scolding the one who makes life unbearable for you. It is right to slap him, so as to reprimand him...). I forgot the French Bible's book name that the reading was in simply because that reading touched me so much that I had started to cry as I was reading it, and the French Bible's names are much different than English, also I'm not familiar enough in the French Books of the Bible's names. I remember though that it was in the Old Testament. I never could find the book or the verse(s) in English. It was meant for me to read (because of what your dad make me go through, or, I should say "what I let him do to me"), I was certain of it, because I started to cry as I remembered the reason why I was at that retreat for. It was to understand why I had such a firm conviction that I had to stay with him even after knowing and living such abuse in that house that I tried so hard to make a home out of, and of what had gone through up till then. And the tears started to pour out as I was reading that I was doing what was right, reading it, right there in front of me, in the Bible confirmation that I was in the right, not the wrong evil person I was told time and time again that I am, and how wrong the husband was. After a while of disbelief of the words I had read set in I sat down in the rocking chair and, I started to rock MY SELF and I continued telling all the feelings I had to PAPA DIEU crying like I never had before. I don't know why I was crying at times and so much so, to the point that my hands and arms had become numb. I really don't know why but PAPA DIEU was HEALING something in me that was excruciatingly painful. I cried for what seemed like 3 hours non stop, from the moment I had read the verse until I realized I was getting numb. At a certain point, I remember I was crying and talking out loud, as if someone was in the room with me, and I was telling my life's story. After the worst part of the crying was over I imagined placing myself into "the favorite place I place myself when in pain and or sad" sitting on PAPA DIEU's lap, my head resting on HIS CHEST, HIS ARMS surrounding me, and HE hushing me to "be still, now!" To just listen to HIS voice, just like a mother does when her child runs to her and is in tears (I have always placed myself in that position since I had made an AGAPYTHERAPY, at that same retreat house a year, or so before. I sit on HIS LAP, and I'm wrapped by HIS ARMS). Then to my surprise, I heard myself say out loud as I saw myself pulling one petal, he loves me, then when pulling the next petal, I heard myself saying "I love him". That had surprised me so much that I repeated the words I had just said "he loves me, I love him." "Why am I saying "I love him" instead of "he loves me"? I asked PAPA DIEU "That isn't right at all". I heard no words, in, or out of me, but there was a force in me that needed to continue saying "I love him". After what seemed hours of this pulling and never seeing the last petal, I started crying painful tears when I had to say "I love him" because I felt your dad did not (and still feels the same today). It was getting more, and more painful that I had to say "I love him", so I cried even more. Time passed extremely slow and I was feeling really let down by PAPA DIEU, and I told HIM that it wasn't fair for me to go through this pain all over again of having to say "I love him". But all of a sudden after I was done complaining and was continuing my "yes/no love search, I realized that I was saying "I love you" while pulling a petal, instead of saying "I love him". That puzzled me, so I pulled another petal, and as real as you see these words you are reading, I heard "I love you."! That shook me to pure reality, an out of mind's eyes conversation for a petals answer. I suddenly realized I was in the nun's bedroom, sitting in the rocking chair. I stopped and listened attentively to the noise coming out in the room. I heard nothing. I closed my mind to the "noise" outside, placed myself back on HIS CHEST" to be able to continue to see the DAISY in my mind's eyes, I know I had heard a voice, and it was so clear as if coming from inside that room. To pursue my last petal search, I kept my eyes closed, the DAISY returned and still full with petals. By then I was being very careful as to hear what I was saying and said it out loud that time while I pulled a petal and voiced out, "I love you". As I pulled the next petal I heard a voice like it was coming from outside of my body, and I heard "I LOVE YOU" said in a softest tone of voice I have ever heard. I could feel that those words were said with real LOVE. I could just feel that LOVE. Tears came rushing out because I wanted what I had just heard to be real, not a "figment" of my imagination. Right away I pulled another petal and said "with all my heart to PAPA DIEU, "I LOVE YOU", then pulling the next petal I heard the words again, but this time it was in my heart, "I LOVE YOU TOO". Oh My God I told myself realizing that what I heard was real. IT WAS AND FELT SO REAL! Let me tell you, I never pulled so many petals in all my life on one Daisy, and I never ran out of petals, and did I ever cry. Tears like a river ran out of me, tears of knowing that I was truly LOVED like I had never felt before. I just lost the sense of time because when I opened my eyes I was lying on the bed all cuddled up with an afghan over me. The afghan that was neatly folded on the foot of the bed that I had noticed when I had entered the room, because I had told myself, "good, if I'm cold I'll wrapped myself in the afghan. Lying there feeling like a new person, with tears in my eyes, not crying tears but tears that felt PEACE FULLY ENVELOPING ME, and the tears were those of pure JOY. When I finally got up I felt light as a feather. Tons of pain and sorrow had just evaporated out of me. I Praised PAPA DIEU for what he had just healed in me. I rocked myself again but this time there were songs in my heart, not pain. I had truly been healed because nothing else but to LOVE GOD mattered to me then, right at that very moment in time. The colors of the room seemed brighter for some reason. And it was PEACEFUL. After a few minutes of rocking myself, I heard someone knocking on the door. They had come to get all those in the area where I was in. When I left that room I left everything that I had entered with. All the past was gone that instant, and I Thank PAPA DIEU that HE made me feels completely emptied of pain that day. I left to go to the gathering room and I don't remember too much after that because PEACE was surrounding me. While leaving I heard someone say, "remember you're going back to the real world now." The rest of the week was still the same, worse from Gisèle, she now wanted to know how my time ALONE had been. She wanted my address and phone number, but gave her my address only. She was the same talkative person but worse now. The week ended with the group sharing about something that touched them during the week. I shared my DAISY time alone experience. The priest -who is in charge of all the events that are scheduled there-, said I was given a GREAT GRACE. I laughed and said, "Believe me father I know". We all laughed and that ended the session and we went to have our lunch and then we all went back "in the real world". Four years passed, and, like the leader had said, "I was back in the real world for sure, but mentally, I would go back to that alone span of time during that retreat, and I received renewed Peace every time. One morning after Mass, in our Church, I was kneeling in prayer asking Jesus to please send someone to help me know what choices HE wanted me to make, for I was so lonely. I was in deep thoughts, as if waiting for a response to my desperate searching as what to do as the right thing in my life. Then, I literally felt a human hand touching my shoulder. I had jumped, and an instant thought came, "OK, hold on now, this can't be real! Can it be an Angel's touch? Am I praying too much?" I had started to opened my eyes to see who or, what had touched me and then I heard a voice saying, "Oh, I'm sorry I scared you, there was Ina, bent, looking at me with a shocked look on her face. I started to laugh saying; "this is the second time a surprise like this happens to me. The other time was at St. Anne de Beaupré and like this, right after Communion kneeling down. Another friend had softly spoken my name. Imagine the surprise I experienced at that moment. Well, this one kind of feels like that time too. I was talking to Jesus then too". Ina had jumped too because I had been surprised and she added, "You jumped so high I thought I had made you have a heart attack. I'm so sorry I scared you like that". I told her how deep in thoughts I was about asking Jesus for help. I was not done talking as she tells me, "deep in thoughts? You didn't even hear me come close to you." Then she added "I just finished praying to Jesus asking Him to help you say yes to what I want to ask you. Isn't God good? We were both praying for the same thing, really". She continued to talk saying; "Bret and I go to a group gathering in Edmunston every Wednesday nights and I think you would like that kind of group gathering, and that is why I had come to talk to you when I scared you instead". We walked out of the Church together as she was telling me what the group is about. Then she added that there was a gathering that same evening. I told that since we both were praying for the same thing that, it must be a sign that I should go. I did attend that evening's group gathering; they even came to get me home, then weekly as I continued to go with them. About the third week after my attending, our group leader informed us that the Edmunston group was going to Montreal, to Danielle Bourgeois' Mother House, our group is one of its branch-. Bret and Ina told me that I have a free ride if I had money to pay for the room and board. It happened that I had enough money plus $10 extra. So this meant that I was going to Montreal to meet our leader in person. We met for two more weeks during which the arrangements were made, and then came the time for our mini retreat for Montreal in my friend's van. It was April 22, 1999. We all met in the parking lot where we gathered weekly and we were only 3 vehicles going, to conserve on the expenses. I knew I was going in Bret's van, but the others were not sure with whom they were going with. It was 6 AM our time, 7 AM New Brunswick's time. When all were present they were told with whom they would go. We were 6 in Bret's van, and there were two women I didn't know. So off to Montreal we went. On the way about ten minutes we all wanted to say the Rosary and then we sang a few songs. Then all was quiet in the van. We were all so anxious to get there, even though we had just been told that the founder +Danielle- would not be there because she had made a mistake in her schedule and, she was giving a retreat at her original home, that was open for her to receive people and give weeks and mini retreats. She also offers, to those who want to stay as long as they want, a place, but they have to pay for staying there even though they are the ones who are taking care of the building as if they owned it, but at a much lesser cost than weekends and weeks retreats. We had just found out just as we were taking off about her not being in Montreal so we were all disappointed and yet anxious to just be in her second building. That second building had been given to her for $1.00 (one dollar!) to make the papers legal. It had been a convent and now a retreat house. Coming back to being in the van, we were all quiet, then all of a sudden Ina, who was in front with Bret turns around and looks at us. I was in the last seat with a woman I had seen at the gatherings and the two other women I did not know were in the middle seats. No one had introduced us, and we had just prayed and sang together, nice! So, as Ina turned around she looked at me and she said;" Oh Bebianne, we have a Marguerite in the van!!!" - Marguerite is French for Daisy- and we were all French. I said, "Really! Where? So I start to look around in the van for a daisy flower. Then Ina starts to laugh and says "non non Bebianne, I don't mean a flower "Marguerite. It's a real live, living in the flesh Marguerite -daisy- she's right in front of you!" I was sitting in the driver's side on back and there was a lady sitting in the seat in front of me. So I fronted up from my seat and I'm trying to look at the woman who was in front of me. Ina says again, " non non Bebianne not her, this one! ", pointing to the woman I could see that was sitting in the passenger's side. Then Ina introduced us to each other. That did not end there. Marguerite wanted to know what I had to do with that name. Ina started to tell them and she was all mixed up, Bret was telling her something that she had forgotten. We were laughing at Ina because she kept on re-repeating words. After a few minutes Ina said; Bebianne, help me and tell us about your Daisy Marguerite story. I said "Okay, but first let me tell you something that confirms that I am supposed to go to Montreal and that Marguerite was not supposed to be in this van. Up till the last minute before we left the parking lot a while ago, Marguerite was told that she was supposed to be in one of the other vans. This move was done about 5 minutes before we left." Ina looked at me and Marguerite and asked is this was true? I continued, "out of two other vehicles she ends up in here with us. This is planned I said, and I told them about the retreat and the DAISY story. They were all impressed. Even Ina said, "I may have Alzheimer but I don't remember at all what you just told us now. This is weird Bebianne!" I answered, "no its not." PAPA DIEU has a plan and HIS plan is enfolding with all of you and me." Remember when you scared me in Church Ina and I told you I was waiting for HIS answer, well part of it is this trip with a LIVE WOMAN DAISY- MARGUERITE- and HE IS not done yet. But, I do agree with you, on the human point of view, that it is weird, not the weird that kids say but, unusual happening." Ina then added; "that's the word I wanted to use but it wasn't coming up. It is unusual that we are all together". And the silence returned while we were approaching lunch time. Then we stopped in Levi, Québec to eat lunch at a Mall. We had one hour to eat and get back to the vehicle we were in. We all made it back on time and all the three vehicles were parked side by side. Then Bret was talking to the other drivers through opened windows about when and where was the next stop ...,etc. While Bret was talking to the drivers, Ina, who was sitting in her seat started to talk signed language with mouth movement and head signs words to a woman in the van next to us, all of a sudden I hear, "Oh Bebianne!" I looked up, and I see her rush out of the van, run to the other van, grab something handed to her, runs back to her seat and she repeats, "Oh Bebianne look here!" I was in absolute awed and dumbfounded, and so were the others in our van. She was holding a framed picture of a field of DAISIES. I said, "O my GOD!" Marguerite says the same, the other women looks at me, their mouths open in shock too. Ina voiced out; "I did not know who had bought that framed picture, but that lady just wanted to show me (Ina) how GODS Creation is awesome", I just added, "I have no idea what HE IS doing, but I now know "HE" does. This is to good to be true! Who am I to receive this?" They all said; don't say that, you're ..."
Ina went to bring back the framed picture to its owner and the people in that van were questioning her about what was all the fuss over a little framed picture and she told them just a little to satisfy their curiosity. When she was back in her seat and we were leaving she told me that the group told her that they have to know about that DAISY story, and that the lady who had purchase it had no idea why she was so appealed to that picture out of all those that were in the store. Then we prayed and sang some more. We made a fuel/restroom stop and then back on the road. Then finally, we arrive in Montreal, at the retreat house where Danielle lived then. So we all got out of our vehicles, not rushing because we knew that the founder wouldn't be there so it wouldn't be the same. We were all together with our suitcases climbing the stairs. The first one opened the porch door and as he opens that door another one opened it from inside and we heard greetings with a great big laughs. When it was my turn to enter the porch there was a little woman, with a joyous smile, who showed me the way inside the building. I was a bit behind from the first ones and I could hear the laughter and the BONJOURS! in the building. Then it was my turn to enter the doorway. I saw two lines of beautiful women with beautiful smiles hugging each and every one of us. Then I was gently touched and hugged by the woman who had opened the door and then she showed me the way to get more hugs, she had said to all of us. Then I was inside and the next in line to receive hugs and there were other people in back of me. I was greeted by three women and was going to the next when I saw this lady standing after just hugging one. I kind of froze, and then I heard myself say, "Oh my GOD you're here! Danielle, you're here I said again. ; She gave me a great big hug and was happy. I was so happy to see her. Then she introduced me to the woman next to her. I was laughing, crying and enjoying such loving people. Our whole group members were in tears, so were all those from the retreat house, because of the love we were expressing to them. What a WELCOME. For certain, PAPA DIEU was involved in this. Danielle told us that we were to celebrate Holy Mass in a couple of minutes, and then we were to come back down for supper. After supper we could go unpack. And she led the way up to the Chapel. When we were going up a set of stairs, there was a wide window and wide window sill. On the window sill three were busts of women Saints statues. I saw the written name of two and their names were Marguerite of... I just touched them all but, not realizing the names I have read as we were going up. I was too moved by the WELCOME we had experienced and my mind was on the Mass. Another SURPRISE that PAPA DIEU had done for me. I was so moved when Danielle mentioned about going to Mass first, I sent out a big surprised gasped, and all the heads turned towards me. I was truly touched. GOD'S BLESSINGS OF JESUS' BODY AND BLOOD FOR OUR SOULS, before food blessings for our body, is what I told myself when I heard there would be a Mass. That's how I took having Mass before food. We all entered the Chapel and there was reverence in the air that I had rarely felt in going to Masses. I went and sat in the front row like I always do in our parish Church, the second row. I passed the front of the Tabernacle to choose a chair carefully, just in case a member of the Team had to sit in that row. I sat and said my THANK YOU(S) and prayed. Where my chair was, it was three chairs away from the front of the Tabernacle, and I was right in front of the little Altar. The Altar was at the left of the Tabernacle when facing it. When finished with my usual prayers I opened my eyes so I could look around. Then I saw a very unusual Crucifix hanging above the Tabernacle. 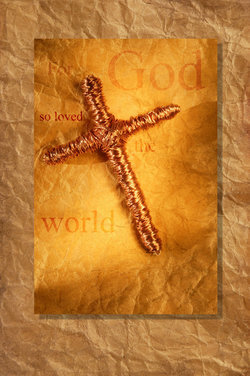 It was not made like a "normal" Crucifix but, it was a shape of a Cross, but Jesus' Corps was a painting. Behind Jesus' head was a round golden halo that, for me it represented The HOST. Next to Jesus in the Cross' painting is a painting of Mother Mary, who is reverently holding a Chalice in her hands that is right under the pierced side of Jesus. Coming out from the wounded side of Jesus is HIS PRECIOUS BLOOD falls in the Chalice that Mother Mary is holding, while she looks intently with her motherly Love at Her SON's FACE, and, Jesus' Face is bent toward HIS Mother. We were told after the Mass that this Crucifix was a replica coming from France when Danielle had been asked to go give a retreat there, and she said that when she saw that Crucifix she felt that Jesus was telling her to bring it to Canada. So the priest gave her one for the Chapel. And she had some made that we can buy that are normal size and some that are about 4 inches high. I bought one of the smaller sizes and I put it under my pillow with my Rosary. Back in the Chapel, as I was looking at everything I could see, on the floor right in front of the Tabernacle was a beautiful basket flower arrangement. I continue to admire the Chapel and my eyes went to the arrangement again, and then I saw, out of all the flowers that were in the basket, there was only one DAISY that was to the side towards me. That DAISY was all propped up on its stem wide open and facing me. I just gasped again I couldn't believe it. I looked if there were others and there were none in front, just on the side towards me. After Mass, I checked and there was another one on the other side of the bouquet, and that one was more in back of the arrangement and it was wilted allot. We went to the dinning room downstairs to eat, and when I had entered the dining area when we had arrived before Mass I had seen on the back wall a hand made, colored with crayons a blue birds, clouds, one DAISY, and some other flowers. Then I had told myself, "is this DAISY happening for real? This is too much, I don't deserve this". But I had not said anything to anyone in case someone would have noticed that one daisy on the wall because since almost everyone in our group knew about it by then, and, even some were calling me Marguerite after that. When we were all present, and ready to find a place to sit, we were told to sit at different tables at each meal, even breakfast, because that is how we get to know each other, Danielle had told us. So we all did just that. Then Danielle added that she lives in an old motor home that is parked next to the garage and she comes to eat with the people who go there. She eats with us and since everyone wants to go sit with her at her table, that way everyone has a chance to sit at her table. We ate and then were told that after every supper meals Danielle has a little talk with the groups, or anyone from outside who already did a retreat there can go after supper, she added; "that's just to help digest our food before we go to bed". After the jokes and hilarious laughter, we were sent off with many wishes of sweet dreams and a restful night. Saturday morning, after a restless night, thinking about all those DAISIES I had seen, as I'm going down to eat breakfast, using the same stairs where the three bust statues of saints were, I took the time to look at one's title, and then it hit me that its name was Marguerite. I checked the others and they were all Marguerite. They were Marguerite of D' Ouville, Marguerite Labouré and Marguerite de Bourgeois (three (3) DAISY SAINTS)!!! My heart skipped a beat as I realized that they were three Marguerite. But I didn't say anything to anyone again as I went down to eat breakfast. After breakfast we had Mass, videos to watch about Danielle's teaching and Danielle was seeing anyone who wanted to talk to her one on one. I tried many times, but I couldn't see her, there were always somebody with her throughout the weekend. At noon for lunch, I went to sit at the table where Danielle was the night before since she was not at that table when I arrived there, figuring that she would go at another table, because we were told that we had to change tables, thinking that she was doing it too since it was her who told us to do that. We were waiting until everyone had a place to sit, and then here comes Danielle who sits right next to me, at the same chair she was the night before. I couldn't believe it. I asked her why she was still sitting at the same table and she flatly answered, "Because I'm the Boss, and what the Boss say, goes" with a great big smile on her face. She then told us that she is the only one who stays at the same table. She then talked and joked allot while we were enjoying the meal. Then one lady in our group, who was sitting at my table but I had not recognized her voice because we were so noisy, and busy eating, had called me to her attention, and, instead of saying Bebianne she had said Marguerite. So Danielle had heard that, and of course she takes a double look at my name tag and says; "Hey, it says here that her name is Bebianne and not Marguerite. Aren't you in the same group? How come you don't know her name yet?" It was Ina who had called me and she started to tell Danielle about the events since my going to the retreat and the Marguerites DAISIES. Suddenly, Danielle stops eating, looks at me and says, "You don't know this, but, my middle name is Marguerite!" I dropped my fork in my plate, and just voiced out a big "NO Way!" in English. Danielle understood what I had said and she said; "It's true. My name is Mary Danielle Marguerite (her maiden name -which I forgot) Bourgeois". 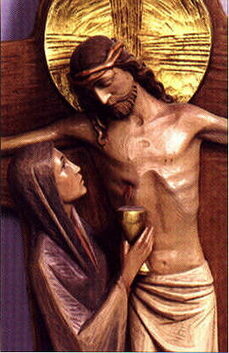 Still looking at me she added; "and, from now on, your name is "Bebianne Marguerite de Jésus". I just voiced out; "Now that is tooooo much." "Oohh no it's not", she added, and continued with "Jesus told you HE loves you, and all these DAISIES/Marguerites things that are happening since you left home this morning are no coincidences at all. HE wants you to be named Marguerite too and I added of Jesus to it. Doesn't that sound good?" she asked the whole crowd. One lady who had been calling me Marguerite because, a woman from our van was calling me that all the time so to tease me, gets up and said; "I've been calling her Marguerite since she arrived, and, someone was asking about who is she, and, I answered them, oh that's Marguerite from New Brunswick. I feel bad now" she added. I then stood up and told her as she was still standing; "Oohh it's much worse than you think calling me that name. You see, my real name is Bebianne, but I'm not even from NewBrunswick, I'm from Maine, in the United States. Were you ever wrong! And I thought I had a hard time remembering names. You beat me here!" A big explosion of laughter and clapping of hands erupted in the room. And so, I was branded Marguerite all weekend long. What another surprise HE sent my way! I now was a DAISY! At the Retreat House every Saturday evening there are some people who lived the retreat that live close-by, go to Mass there, and, after Mass are invited to go in the dining room for family fun with those who are on retreat. "We have a last evening together and it's usually fun" Danielle said, and added, "And, I always ask those who attended a weekend or a week with us, if they want to say anything about what they received, especially now that you, this meant our group from Edmunston- are "our Family Group members" now that you lived a mini retreat with us. Is there anyone who was touched by something they lived or heard or even read? Please share with us, so we may be fed also". Many in our group shared beautiful moments, and, I felt I just had to share about my DAISY Story -MARGUERITE-, the happenings since Ina told me about the lady named Marguerite in the van, and, the daisies in all the new flower arrangements, the three bust statues of Saint Marguerite, the name that the lady in our group was calling me by, the name that Danielle gave me, Danielle's middle name, and on and on. Most of all, how I had never ran out of petals at the retreat at Le Cénacle in Rivière-du-Loup, and how it was confirmed here to the utmost capacity. That this, was overwhelming for me to receive, and here by complete strangers that became friends in a matter of minutes. 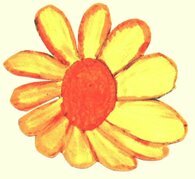 And when I was done talking I turned around, walked real fast to the back wall, and pointed to the homemade orange and yellow DAISY that was pinned on the wall. I heard a great big OOHHHH!!! Everyone was in awe that I had noticed it, no one else had. Even the ladies who had made those by hand in decorating had not even paid attention of a daisy. One said; "we just made flowers, any flower." I concluded with telling them that I had seen that DAISY the instant I had enter the kitchen area when we had arrived on Friday. I then walked back to my seat, shaking like a leaf, and, all of a sudden I felt a strong hand stopping me, I turned to look who it was, and there, a man who lived there had gone to take the DAISY off the wall, and was giving it to me. "Oh my GOD", I exclaimed. I took the DAISY, clasp it to my heart and tears were running down, our eyes, and the whole crowd too. He gave me a great big hug telling me, and the crowd, how much that had touched him, and, that from then on, he would never doubt Le PÈRE (THE FATHER) ever again! We gave each another huge hugs and everyone in the room clapped and stood up all at the same time in an uproar sound. I got a standing ovation Daughter! Just then Danielle said; "I re-named you Marguerite", and she told them about our lunch experience when I found out that her middle name is Marguerite, and how she had re-named me at noon. Then she added, "again I re-name you, Bebianne Marguerite de Jésus!" The whole crowd clapped even more and all were whipping their eyes and they all came together forming a circle and we sang songs of THANKS. One lady member came to give me two sheets of paper about DAISIES and told me I renewed her faith. This started on April 22, 1999 since that day we left from Edmunston to Montreal, with the woman named Marguerite in the van I have seen a DAISY EVERY SINGLE DAY SINCE! EVERY SINGLE DAY I HAVE SEEN AT LEAST ONE DAISY, OR EVEN THE WORD DAISY. I EVEN GET SOME THROUGH E-MAILS!!! That is why I started to cry when I saw your "Welcome to the E-mail" card you had sent me. THIS IS GOD/JESUS' WAY OF TELLING ME THAT HE LOVES ME, AND I LOVE HIM. I NEVER RAN OUT OF PETALS SINCE THAT DAY - APRIL 22, 1999. Isn't that just awesome? Isn't this too good to be true? I live that reassurance from HIM daily. Bless you Daughter for sending them to me also. ~ This is the hand made DAISY that was on the kitchen's wall area at the Solitude Miriam's House in Montreal. I kept it, as you can see. I placed it on my bedroom's mirror frame dresser. I see that DAISY on a daily basis, and most of the time I don't even put "eyes/vision/heart/object's importance" in my mind. I see that DAISY, but my mental awareness of "what" it means to me does not even surface in my mind's heart. Then some days, when I see it my heart is aware of what I'm seeing, and, then with all the love I have in my heart I tell PAPA DIEU that I love HIM too, I often add; "I know YOU LOVE me more than I YOU". 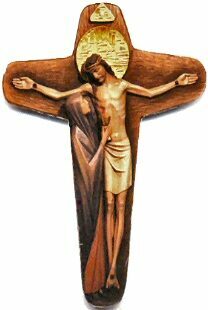 ~This is the Crucifix I purchased at Miriam Solitude's House, and a replica of the one in their Chapel in Montreal.